(CNN) — Bolivian officials say their country’s presidential plane had to land in Austria on Tuesday after false rumors circulated that former U.S. National Security Agency contractor Edward Snowden was aboard the aircraft. Portuguese authorities wouldn’t let President Evo Morales’ plane land for refueling in Lisbon, Bolivian Defense Minister Ruben Saavedra told CNN en Español. French authorities also wouldn’t let the plane enter their airspace, he said. The situation is the latest twist in what has become a global guessing game over Snowden’s next steps. Snowden has admitted leaking classified documents about U.S. surveillance programs and faces espionage charges in the United States. He has applied for asylum in 21 countries, including Bolivia. 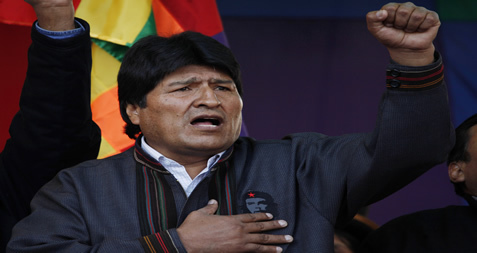 Morales, a left-leaning president who has long criticized the United States, had been attending a conference of gas-exporting countries in Russia, where he told the Russia Today news network that he would be willing to consider asylum for Snowden. But Bolivian officials stressed that accusations that an official aircraft would harbor Snowden were baseless. “We cannot lie to the international community by carrying ghost passengers,” Choquehuanca said. Garcia Linera said that since the plane’s landing in Austria, some European officials have said they would let the plane fly over their airspace only if investigators are allowed to search it — a condition which the vice president called unacceptable. “We are not going to accept blackmail or any type of conditions,” he said. Protesters waving Bolivian flags crowded outside the French Embassy in La Paz Tuesday night, calling for the embassy to be booted from the South American country, state-run Bolivia TV reported. Choquehuanca said authorities from the South American country are investigating the source of the false rumors about Snowden. Saavedra told CNN en Español that he believed the U.S. government was behind the rumors. Bolivia’s air travel rights were violated, he said. “It is an outrage. It is an abuse. It is a violation of the conventions and agreements of international air transportation,” he said. The plane had been flying from Moscow back to Bolivia. The original flight plan had a refueling stop scheduled in Lisbon, said Saavedra, who is traveling with Morales. Once Portuguese authorities told them they couldn’t land there for “technical reasons,” the crew changed course for the Canary Islands, the defense minister said. Right before the plane was about to fly over the French border, authorities there said they couldn’t enter the country’s airspace, again citing “technical issues,” according to Saavedra. “The crew informed us of this situation … and out of caution they suggested we turn back and land at the airport in Vienna, which we did,” Saavedra said. Bolivia’s foreign minister told reporters that the move had put the president’s life at risk. “Portugal owes us an explanation. France owes us an explanation,” Choquehuanca said. The situation drew a swift rebuke from Ecuador’s foreign minister, who told reporters he planned to call a regional meeting of the Union of South American Nations, known as UNASUR, to discuss it. “We consider this a huge offense, and I will call for a UNASUR special summit with foreign secretaries to discuss this issue,” Ecuadorian Foreign Minister Ricardo Patino said. Cuba’s Foreign Ministry released a statement condemning the incident. “This constitutes an unacceptable, unfounded and arbitrary act which offends all of Latin America and the Caribbean,” the statement said. It isn’t the first time Bolivian authorities have accused U.S. officials of trying to meddle with their presidential plane. Bolivia and the United States have had diminished relations since September 2008, when each country expelled the other’s ambassador. Morales, a strong proponent of the cultivation of coca plants — the source of cocaine — expelled the U.S. Drug Enforcement Administration a month later. He also delivered a strong verbal criticism of the U.S. government at the United Nations General Assembly that year. In May, Morales said he was expelling the U.S. Agency for International Development from his country for allegedly meddling and conspiring against the government. The U.S. State Department denied the accusation, called the decision regrettable and said the ones who will be hurt by the expulsion will be ordinary Bolivians. Tags: Bolivia and Edward Snowden, Edward Snowden was aboard, Evo Morales and Edward Snowden, Was Edward Snowden aboard? Home » Apoyo » Was Edward Snowden aboard?